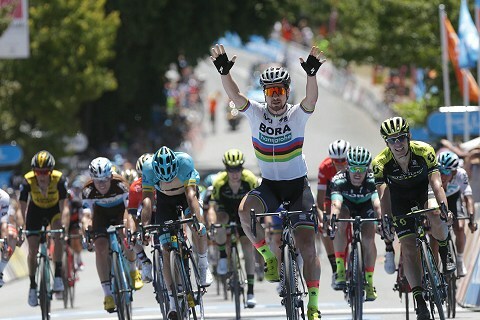 Three time World Champion Peter Sagan will trade his rainbow jersey for the Santos Ochre Leader’s Jersey after winning Bupa Stage 4 of the Santos Tour Down Under in Uraidla. Bupa Stage 4 began in the leafy shopping strip of Norwood and took the race out through Gorge Road into the Adelaide Hills. The start time was brought forward an hour in a bid to minimise the impact of the extreme heat that has hit Southern Australia this week. Even so the riders started the stage with the temperature already in the high 30’s and it soon rose above 40 degrees. Despite the stifling conditions around 70 thousand fans flocked to the race today in support. The teams were well prepared with extra support being provided and a relaxation of the usual rules to ensure the riders were hydrated. “It’s been a very hard day of racing but maybe not the hottest in my career so far as I’ve experienced something slightly hotter in California a couple of years ago,” said Sagan. The stage included the famous Norton Summit, a mecca for cyclists who swarm to Adelaide at this time of year. The 5.6 kilometre climb has a gradient of five percent which gave the climbing big guns the chance to break up the race and make their bid for overall honours. The summit was eight kilometres from Uraidla and It was \ a fast twisting mainly downhill race from there to the finish line. It was the four time Tour champion, Simon Gerrans, setting the tempo on the front for his Mitchelton Scott team mate, Impey, as the race headed up the climb. But whilst it tested some in the peloton, there was still a bunch of 35 riders together with Sagan at the finish. “It was a free-for-all in the finale,” said Impey. “It was a bit easier than I expected on the final climb (but) I knew with Peter Sagan there, it wasn’t going to be easy.” The win has given the world champion a two second lead over Impey with Sagan’s Bora Hansgrohe team mate, Jay McCarthy sitting third, nine seconds off the lead. “Tomorrow will be again another story,” said Sagan. “I’m in the ochre jersey now but we all know we are racing here for Jay McCarthy. It’s his home race. 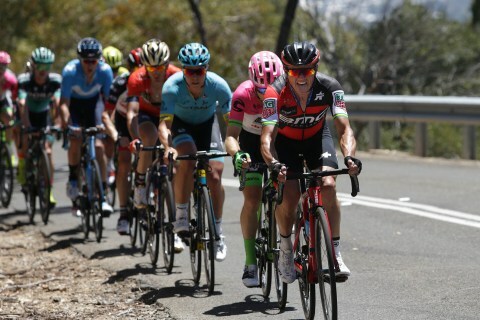 He’ll have a much harder climb than today to have his say tomorrow.” Stage 5 traditionally decides the race and there are 33 riders within 14 seconds of the lead which has set up a thrilling contest as the contenders battle for honours on Willunga Hill. Sagan’s team director Patxi Vila says the team had identified two stages suited to the world champion, yesterday to Stirling and Uraidla. “Here it’s a kind of climb where to drop a good (in form) Peter (Sagan) you need to go very fast,” said Vila of the pace that whilst not fast enough to impact Sagan had a big impact in other areas. “Today was very hectic and so hot. We ran out of water bottles in the team car and we had to stop and get more bottles. UniSA-Australia kicked off the stage with a breakaway by Zakkari Dempster and Alexander Porter. The pair time trialled strongly and were soon almost ten minutes down the road. 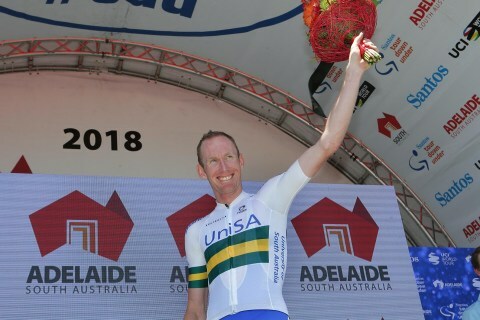 They contested the first southaustralia.com Sprint at Birdwood (35.8km) where Dempster took top points ahead of Porter, more than eight minutes later yesterday’s stage winner Elia Viviani (Quick Step Floors) crossed at the head of the peloton for third place sprint points. The second sprint at Charleston came 70 kilometres into the stage and while the peloton had begun the chase the lead pair were still 5.40 ahead. This time it was Porter who took the points ahead of his team mate Dempster. A flurry of pace from the Quick Step Floors team delivered Viviani across the line in third place. The gap continued to come down dropping to four minutes as the leaders rode into the final 50 kilometres but Porter, 21, decided his day was done and he sat up leaving 30 year old Dempster to ride on alone. Dempster made a valiant effort to stay clear but to no avail and 15 kilometres and he was caught 15 kilometres from home.